Have you heard the news? The number of people looking for jobs is a tad below the number of job openings. It is if you’re a wage earner. But if you’re an employer, it’s horrifying. A recent article makes it seem as if the end is nigh. “America’s labor shortage is approaching epidemic proportions, and it could be employers who end up paying,” writes the pundit. Quelle horreur! Imagine employers having to raise wages! We all say we want economic growth. We want widespread prosperity. We want two chickens in every pot. Owners of capital are doing fine. Profits are at historic highs. Everybody’s excited about high earnings. But if you don’t own capital, and you’re not living on profits, interest or rents, prosperity means you need to earn more money from wages. Period. And yet here we are, with the main spokespersons of U.S. business warning of inflationary chaos if wages start to rise. Here’s a fact you won’t see at CNBC or The Wall Street Journal: In the current context, the interests of employers and wage earners are not the same. Whose interests prevail has big implications for the rest of us. An economic crash is caused by a collapse in demand. Spending — on investment, wages and consumption — plunges across the economy. In 2008 this happened because financial markets froze when everyone realized we were in a credit-driven bubble. The assets on banks’ balance sheets were largely worthless. The policy response was to “give” money to the financial sector via bailouts and super-low interest rates. End of their balance sheet problem. As we all know, that has been a great policy for owners of capital and investors. Profits and equity values are up. We’re told that the 2008 crisis has been solved. It hasn’t — not by a long shot. But after 2007, there was no catch-up growth. Instead, we experienced slower-than-average growth in the years after the crash. 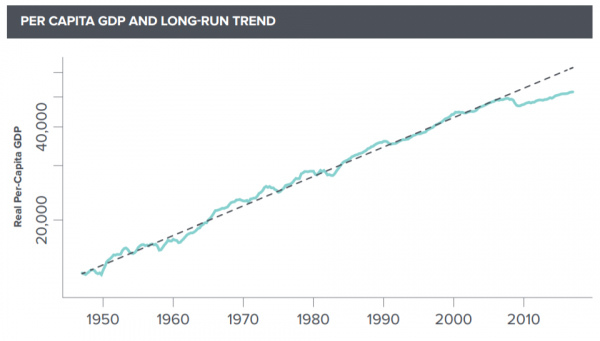 As a result, the gap between actual economic output and the long-term trend line is big and getting bigger. If we had followed the pattern of catch-up growth after recessions, U.S. output would be $3 trillion higher than it is. Nearly every economic indicator other than profits and asset prices — productivity, inflation, interest rates, the wage share of national income and rates of investment — fell after 2008 and have stayed down. That’s because of chronic lack of demand. Productivity and investment are low because businesses don’t spend money on labor-saving machinery when workers are cheap. Inflation and interest rates are low because the economy is below capacity, and because people don’t have money to buy things. Some people say that the problem is robots displacing workers. But if that were the case, we’d be seeing higher productivity and capital expenditure. We aren’t. What we’re seeing is a new type of U.S. economy in which most of the benefits of growth flow to owners of capital. 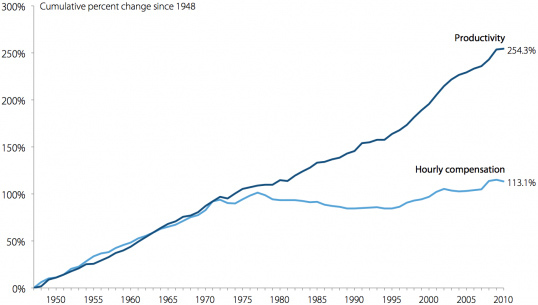 But it’s not entirely new — it’s the way things were before the Great Depression. Even with GDP growth so far below the long-term trend line, the owners of capital are earning more than they did before 2008 … because they take such a large share of national output for themselves. Starting in the mid-‘70s, almost all the benefits of productivity growth have gone to owners of capital. Wage earners, not so much. There are two ways to make a profit in a capitalist economy. One is to constantly improve efficiency and outcompete other companies. You pay your workers well because you share the benefits of success with them. They work hard in return … and they use their wages to buy your products, and those of other companies. Everybody benefits. The other way is to use political power and influence to ensure that wage earners are constantly on the defensive. You demand that the Federal Reserve put the brakes on the economy at the first signs of a tight labor market. After all, that might require wage increases that cut into your profits. Or worse … confident workers might start organizing unions! The reality is that U.S. capital owners have become increasingly dependent on profits that come from an economically and politically weak wage-earning class. In that context, a big economic boom is a threat … because it would shift the balance of power between owners of capital and wage earners. This pattern of easy profits from political power rather than the hard way — from innovation, competition and enterprise — is common throughout the world. The Third World, that is.